In direct contravention of all parenting/couple advice, Colin and I rarely ever have date nights. I suppose we're too exhausted from parenting, and when our sweet troublemakers finally go to sleep, we're not far from collapsing behind them. But a few weeks ago, we made it happen. And it was just in time. We were... well.... having one of those rough times. Colin was stressed out with work, and we were both getting impatient with each other. Colin was in a funk, and I was annoyed that it was starting to feel contagious. I resenting him for being down, just at the time when he probably needed my support. There was a lot of snapping at each other and passive aggressive muttering under (my) breath. It was hard to have sympathy for each other since we were both wallowing. There was a dark cloud hanging over our house. But then we managed a date night. We lifted ourselves out of our misery and met some friends for drinks at a rooftop bar/restaurant. And something magical happened. Simply being out of our house, away from fighting flashpoints like dishes and crying children, and looking over Kisumu city at night time put everything instantly in perspective. And it felt like a treat. We felt like a couple. Riding a wave of relief and euphoria, we even went dancin g. Dancing! On the tuk tuk ride home, we held hands and snuggled into one another feeling that charge of affection we had when we first started dating. 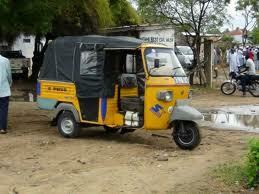 For those who don't know - this is a tuk tuk. Second only to a horse-drawn carriage in the romance department. Obviously. The next morning, after taking turns sleeping in, I came downstairs to see Colin making breakfast. And I thought, "I love that man." I wrapped my arms around him, and he pulled me close, returning my sentiments. Caleb, feeling left out, inserted himself between us. We looked at him and then each other and laughed out loud feeling a domestic levity we had been missing. It was all going to be OK. The dark cloud was lifted. We were OK. Damn. Date nights are the best therapy ever. So, we had another one. This past weekend we went out for a quiet dinner - just the two of us. Our nighttime usually consist of cajoling Caleb to eat his dinner, pacifying a day-weary Emmet, running through the bedtime routines, and then sticking our noses in our computers until we fall exhausted into bed. We probably could have long meaningful conversations about life, but we don't. But on our date night, with nothing but a candle and a table between us we were able to do just that. We talked about our future, our past, books, big ideas, and (inevitably) our children. And amid this conversation with my best friend and most honest sounding board, I figured out something important. Here it is: OK. So, if there's one thing that periodically depresses me, it's when I compare myself to the achievement of others. I suppose this is typical - the result of growing up being told the world was your oyster, that you could achieve greatness, with the implicit assumption that you should. But my comparison group of expats here in Kenya consists of a disproportionately large group of hyper-accomplished people. IPA is run largely by development economists - young, smart, over-achieving, idealists, who distinguish themselves intellectually at the same time as they make a contribution to alleviating poverty The other main group of expats work at the CDC, using their MDs and PhDs doing such noble things as working on malaria vaccines. Anyway, we got to talking, over wine and pasta, about my professional future and my return to the workplace. We talked about the importance of finding my niche, the best way make an impact with what god gave me. And I suddenly became totally overwhelmed. Why was I still having this conversation in my mid/late (just late?) 30s? That too made me feel inadequate. And maybe it was the wine or the liberation from children, but suddenly my overwhelm tipped right on over to epiphany. F*@k it, I thought. Why is some socially sanctioned idea of success and achievement my goal anyway? It's a trap. A rat race for satisfaction that you can't win. "You know what I really want?" I said, pausing for dramatic effect, "To be good to the people around me. Because you know, maybe that's my gift, and maybe that's what ultimately matters anyway." "Well, you're not always good to me." He countered, only half kidding. "OK. That's true." I admitted because Colin does bare the brunt of my bad moods. But I was busy with my epiphany, so I continued. "Maybe all this pressure to distinguish yourself, to leave a mark to figure out your unique contribution is self defeating. Maybe it's OK - even better - just to do what you can to support your family and make yourself happy as long as it leaves room for you to be good to people around you." "It sounds like you're working your way into a solid graduation speech Kim." He teased. "Or I was thinking more...religion." I deadpanned. We laughed together. Colin probably at my wine-fueled enthusiasm and me at the relief I felt at my realization. This is not a cop out are an excuse for mediocrity. It's really a way to refocus my intention on what;s important A way to feel satisfied and thankful for what the considerable gifts I have, instead of always wanting more. It's also not at all original. But I needed that particular epiphany at that moment. And it might not have happened without the space of that date night. Of course nothing is permanently changed. In a few weeks domestic drudgery might reemerge along with existential doubts. But at that point, I guess we'll just have to go on another date night. If only there was somewhere to go for a date night and someone to look after the kids. Our last one was when we were in the States over a year ago and we are definitely in need of another one. I'm so glad you had your date nights and your epiphany. It's always dangerous to compare yourself too closely with others, especially when you look at just one aspect of their lives (like their career success), there is so much more to life than that and those same people may be looking in at your life with longing. Bummer that there is no where to go for a date around you! Colin and I used to have "stay-tes" (like a stay-cation, but stay-date). We would just somehow make the night more special after the baby went to bed. Cook a more interesting meal, put some candles around, have a glass of wine and decide NOT to get online or watch a movie. That might work if you can't get out of the house? And you're totally right - so often comparisons stop at someone's professional achievements and that's only ONE aspect of someone. Thanks for your (as usual) empathetic comment! It may take you years to come to this conclusion - I know it did for me - after all, I was junior Mayor of Chicago and elected most likely to succeed in high school. It sounds like a cliche, but I have come to the conclusion that the best accomplishment I have had is raising my family. I am proud of my accomplished, sensitive, caring children who have become adults that I am proud of - who care for their families, othersand their communities (even if it has taken those I love far away from us). That's not to say I didn't think I should have a career or that I don't enjoy what I am doing. You will find a balance that will make you happy. Wow! I don't think I knew that you were voted most likely to succeed! And you are right. You did succeed. It's just hard to keep reminding myself that all this career stuff isn't everything when I'm surrounded by such type A over-achievers. But deep inside I do know that that is not what ultimately matters. When I go, I'd rather people say, "she was good to the people around her" than "she achieved x, y, z." Looking forward to talking more about this in person!! Also, did you secretly tape my last date night, and write about it? I literally had that exact same conversation this weekend with those exact same feelings (of built up 'argggg' followed by 'i love this guy'), and we don't even have children yet. At some point, I think we just need to stop comparing. (Says the child of a Taiwanese mother, the child who has to actively fight the need to compare herself b/c she truly doesn't believe in it but has it so deeply ingrained in her psychology ...) I used to think, "Well, this person is really amazing at A, B, C, but then look at X, Y, Z...it all evens out". And then I met people who were perfect. So perfectly gorgeous and smart, interesting and fun to be around, and still HUMBLE, so you couldn't even hate them. At that point, I was like – wow, life just isn't fair (unless you believe in reincarnation). So I need to stop dwelling and just focus on being the best version of me. And if someone is NOT okay with that goal, then ppppthththtthth (giant tongue stick out) to them. "So I need to stop dwelling and just focus on being the best version of me. And if someone is NOT okay with that goal, then ppppthththtthth (giant tongue stick out) to them" EXACTLY!! You always manage to add a thoughtful comment AND put a smile on my face. Thanks for that! And you're right. The more we look to the future the more we miss the present. Hippy dippy, maybe. But true! It IS easier to stay at home in exhaustion isn't it? But getting out (for me, even taking a solitary walk) gives us a different perspective. You and I have definitely hit the same perspective. All the (western world?) fuss over being a success and making a big mark on the world is intensely individual even when it's about doing good. And that may not be why we're here. There's a ripple effect to what we do. A small kindness shown to one person can change the world in ways that well-funded programs run by highly accomplished people can not. There's power in person-to-person love. At the end of my life I want to know only that I've expressed and amplified the love I feel.